We don’t eat that much bread in summer. I didn’t want to stack up the freezer with it because I am trying to clear out the freezer in readiness for our holiday but we had run out, so I had to make something. I decided to make two small loaves, one for the freezer and one for now. We will definitely finish these before the end of next month. 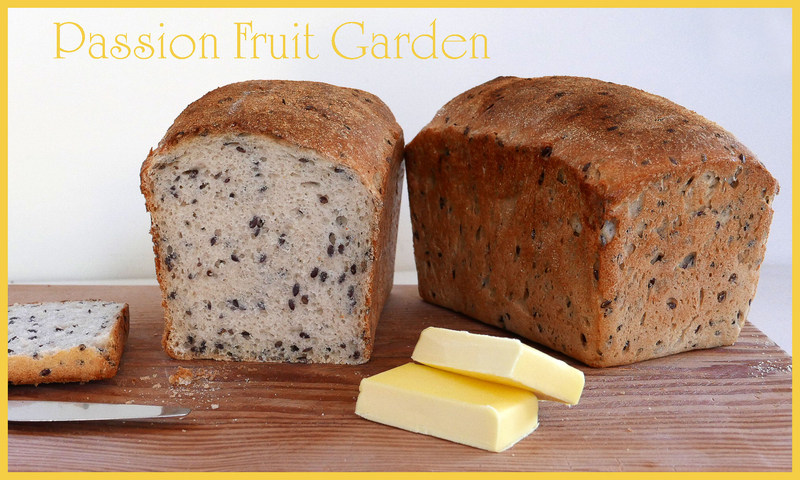 This recipe is based on a number of loaves I have already posted. For some unknown reason, I wanted to add some linseed this time so I amalgamated a couple of recipes. The technique is how I always make my bread. *If your starter is not 100% hydration, adjust the water content appropriately. 100% hydration starter merely means equal parts, by weight, of water and flour so, in this case, the 300g of starter is 150g of flour and 150g of water. **As always, the water is an approximation but this is what I used. Soak the linseed in the 300g of water and set aside. Feed your starter and leave it out on the bench. As it is quite warm here, I left mine outside. It is cooler there than in the house. Put all the ingredients (except the salt), including the soaking water, into your mixer bowl and mix on Low until just combined or, if kneading by hand, mix with a spoon until just combined. Cover and leave for 20 minutes. Add the salt and knead the dough in your electric mixer for 5 minutes or by hand until it is smooth (about 10 minutes). The dough should clear the sides of the bowl of the mixer and, near the end of the 5 minutes, begin to clear the bottom of the bowl. If it clears the sides and the bottom early in the kneading process, add a bit more water. If kneading by hand, it should be sticky – don’t add more flour. Transfer the dough to an oiled bowl, cover and leave for 50 minutes. Divide and shape the dough into two. I decided to make two small sandwich loaves. I made 2 batards and then placed them right side up in my bread tins. My tins are 17.5 cm long and 10.5cm wide at the top. Alternatively, you could make one medium loaf, in which case use one tin about 24cm long and 10.5cm wide at the top or make one free-form loaf. I placed a piece of baking paper in the bottom of the tins just to make sure they released easily. An hour before you are ready to bake, place two ceramic tiles in your oven and preheat it to its hottest temperature. When ready to bake, place the tins in the oven on the tiles. If you are making a free-form loaf, follow the baking instructions in my Pain au Levain with Mixed Sourdough Starters post. Here is the link. If you are making one medium loaf rather than two small loaves, cook it for about 45 minutes. This entry was posted in Bread, Sourdough and tagged sourdough sandwich loaf by Glenda. Bookmark the permalink. I particularly like the ratio of butter that looks set to be spread! Hi Carol. Good luck. I am sure you won’t look back. If you are wanting detailed instructions check out my earlier posts. If you wish. Those loaves look lovely. I often play around with inclusions and different flours… but never have written it down except the original recipe which I loosely follow, probably won’t but it’s a good idea. I making a loaf to take with us on a family visit because I can’t stand the nasty cheap bread they buy. Hi Ella. I decided to write it down because I always seem to be redoing the same calcs. It is good to know how much flour for which tin. That made me giggle. When mum died about 10 of us all brought milk when we gathered at the house cause she use unbranded powdered skim milk. Let’s just say she cut costs on the ratio of powder she used to make the milk.